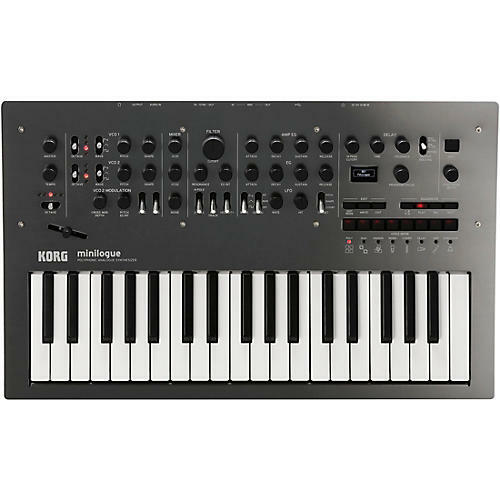 Fully programmable 4-voice analog synthesizer with 37 slim keys. The minilogue is not a refresh of an old-time favorite, but instead a completely original concept that’s been elegantly designed from the ground-up for today’s modern producer. There’s nothing to emulate, nothing to model after, just 100% pure analog synthesis that is fully programmable for a seemingly endless possibility of sound creation. Find inspiration it its sound with features including a polyphonic step and motion sequencer, on board tape-style delay, multiple sound shaping and filter options, and an oscilloscope display. All of these seamlessly integrated features make minilogue as fun and easy to use as it is powerful. It's the next-generation analog synthesizer for musicians of all types. The synth circuits for minilogue are all new ground up designs, delivering a synthesizer experience like no other. Unprecedented in this class, it’s a four-voice polyphonic true-analog synth with an interface that's designed for accessibility. Whether you're performing live or producing in the studio, the minilogue is the fastest way for the user to explore and implement real analog synthesis in any situation. The structure consists of 2VCO, 1VCF, 2EG, 1VCA, and 1LFO. The minilogue's unique wave shape capability lets you fine-tune the oscillators’ harmonics, creating the most divine sounds and compositions. The minilogue is also equipped with a variety of powerful types of modulation including cross modulation, oscillator sync, and ring modulator, as well as a delay with a high-pass filter. Powerful sound creation and rich variety are the true hallmarks of an analog synthesizer. minilogue goes beyond analog synths in its price range by adding 200 preset locations. Select a program for instant access to great sounds—ranging from thick basses and deep pads, to brilliant polyphonic leads and atmospheric sounds. No need to have deep synthesis knowledge; just choose a sound and tweak— a workflow that is very familiar with musicians today. For those who want to dive deeper into the heart and soul of minilogue’s engine, the minilogue can hold 200 programs; with 100 editable factory programs included, and 100 locations serving as blank canvases on which to create your next analog masterpiece. Each preset can also hold a step sequence and delay settings along with the sounds you create. Selectable voice modes let you freely configure the four voices for performance. The voices can be set to 4-note polyphony for chords or layered for thick basses and leads. Other modes cover a range of sounds from octave shifted bass explosions to delicately staggered layered triggering. Order minilogue, Korg's next-generation polyphonic analog synthesizer—and so much more.